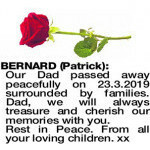 A Requiem Mass for the late Mr Patrick Bernard of Armadale will be celebrated in St Francis Xavier Catholic Church, 279 Forrest Rd, Hilbert commencing at 10am on WEDNESDAY (3.4.2019). 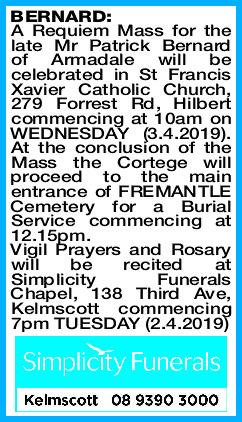 At the conclusion of the Mass the Cortege will proceed to the main entrance of FREMANTLE Cemetery for a Burial Service commencing at 12.15pm. 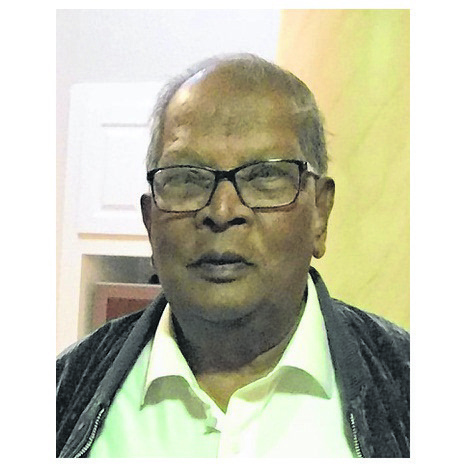 Our Dad passed away peacefully on 23.3.2019 surrounded by families. 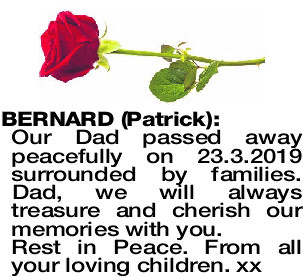 Dad, we will always treasure and cherish our memories with you. We will never forget you. We will miss you dearly. We will always love you. Thank you for the love and support you gave us. Your loving daughter Mary and Terry Moore. 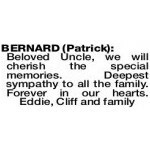 RIP Dad. My loving Dad and our dearest Papa, we will never forget you. We will miss you dearly. Thank you for all the things you've done for us and thank you for the love you gave us. We will always love you. Daughter Caroline, Peter and grandchildren Alexander and Elizabeth. 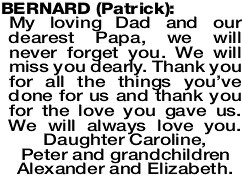 BERNARD PATRICK We love you very much and you will always hold a special place in our hearts. You worked very hard and brought the family to Australia for a better life. For your unconditional love, support and guidance throughout my life. I thank you Dad. Your last few days are precious and the tearful special blessing you gave as you left us, will always be cherished. Miss you so dearly. 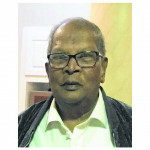 RIP Dad. 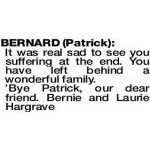 BERNARD PATRICK It was real sad to see you suffering at the end. You have left behind a wonderful family.